The Inclusive Class: 10 Websites That Will Help Your Child With Homework! 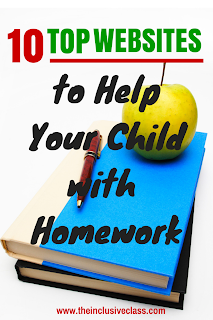 10 Websites That Will Help Your Child With Homework! Here is an updated list of 10 Websites That Will Help Your Child With Homework! Some of these sites are designed to support the concepts of Common Core. In addition, I have included not only sites that offer homework assistance but sites that have information and tools to help students complete their work. These sites of useful for students of all abilities and ages. 1. LearnZillion - this is a fantastic resource for students who need help understanding the new Common Core concepts. Short, video lessons reinforce learning from various curriculum areas. 2. Khan Academy - Learn almost anything on Khan Academy's website! Videos help explain and reinforce curriculum topics from math, science, art history as well as test prep. 3. BJ Pinchbeck's Homework Helper - This is a curated website of dozens of online resources to help students, parents and teachers with homework. It is geared for students of all ages. 3. The Homework Guru - Susan Fitzell lists strategies, resources and ways to work with your student's learning style in order to get the homework done! 4. SparkNotes - Designed for older students, SparkNotes is a resource students can go to in order to give themselves a better understanding of the books, coursework and assignments. 6. Discovery Education - Suited for all ages, Discovery Education offers a Homework Help page with videos, webinars, activities and webMath (an interactive tool that helps students understand math problems!). 7. Ten Special-Needs School Tools - This is an site with information for parents and teachers. Terri Mauro, from Parenting Children with Special Needs lists her ten favorite items for helping students complete school work with items such as pencil grips and fidget toys. 8. US Dept of Education - Helping Your Child With Homework - Here is another site with information and resources for parents about homework. It offers ways to help your child with homework, explains the purpose of homework and suggests ways to talk to your child's teacher about homework. 10. Graphic Organizers - Using graphic organizers is another way of helping students visualize what they learn. Graphic organizers can also help them organize for writing. There are many types of graphic organizers to choose from depending on the type of assignment and your child's learning style. Hope you find this list helpful! Please comment if you have any other sites that are great! Thanks for such a great help.My little brother needs that.He struggled with his homework daily. thank you for your valuable post .your post and views are really helpful for the readers and provide relevant knowledge about the topic. Thanks for the info! Children always love to use new technologies such as internet. Maybe they can enjoy their homework more by using these sites and the information would be helpful for all the parents.